Through 25 rhyming devotions and fun activities, Mom can answer these questions for the curious little one. It’s a great way to introduce kids to faith at an early age yet in an age-appropriate and understandable manner. Each devotion also includes a short Bible verse and a prayer that mother and child can recite together. Some of the activities include creating a card, making a heart wreath, and singing―all of the activities are directly related to the theme for the devotion. These devotions translate to hours of meaningful, faith-filled fun. Crystal Bowman loves writing books for kids. Her books come in all shapes and sizes and many of them have become best sellers. Whether her stories are written in playful rhythm and rhyme, or short sentences for beginning readers, she tries to make them so enjoyable that kids will want to read them over and over again. 'But the most important part, ' she says, 'is to teach children that God loves them and cares about them very much. My Mama and Me by Crystal Bowman is a wonderful children's book! 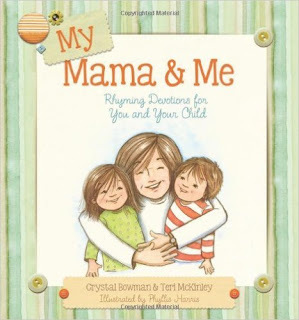 I love that My Mama and Me by Crystal Bowman is specifically written for mother and child. My Mama and Me by Crystal Bowman includes 25 rhyming devotions, a short Bible verse, a prayer that mother and child can recite together and some activities. My girls and I absolutely love this book! The 25 rhyming devotions are beautifully written and the prayers go with the devotions perfectly! My girls and I also really love the Fun Idea for Mama and Me at the bottom of the page because it gets us all involved and really helps us focus on that days devotion. The illustrations are beautiful and I love that under each illustration is our Bible verse for the day. My Mama and Me by Crystal Bowman is such an amazingly wonderful devotional for moms and kids to read together! You can find My Mama and Me by Crystal Bowman on Amazon, Barnes and Noble and other bookstores.